Spring is on it’s way and I am thinking about bags. I am completely in love with the bags and accessories offered by Vera Bradley. Aside from the vibrant fabrics and pattern variety, I find that Vera Bradley products are durable and the craftsmanship is of the highest quality. Just by studying any one of the Vera Bradley products, you can feel the sturdiness of the fabric and see that the stitching is impeccable. The Vera Bradley site has already launched it’s new line (I know because I am on it every day). I LOVE the Frill line! It is so feminine and I appreciate the attention to detail that is characteristic of Vera Bradley products. If you are contemplating a piece from Vera Bradley, I highly recommend starting your collection with one of the smaller pieces. I love the functionality of the Clip Zip ID Wallets. These are especially great for someone who does not like to carry a bag. The wallet allows you to stash your driver’s license in the front window for easy viewing (like when you are asked to show it for that bottle of wine) and hide your other cards/cash in the zippered compartment. I also love that the wallet has a beefy ring to attach my keys for easy carrying. Another great accessory that is similar to the Clip Zip ID Wallet is the All In One Wristlet. These highly functional and fashionable carriers provide a pocket for your phone/music player, three credit card slots in a zippered compartment, and a clasp strap so it can be attached to a bigger bag. These are perfect for travel or times when you want to go lightweight instead of carrying a bag. Ever need a splash of color? Check out the Reversible Belt that features a coordinating fabric on each side. The buckle allows the belt to be adjusted by a simple loop, so no need to worry about growing out of it by going up or down a size. I have to admit that I rarely use place mats on my dining room table. I do, however, think they are absolutely adorable (on other people’s table) when they reflect a particular season or holiday. Last Christmas, I decided I would make some festive place mats for my loved ones and their children. I picked a fun design with ginger bread men on one side and a solid brown fabric for the reverse side. I chose brown with the hope that the place mats could be used in autumn and then flipped to reflect the Christmas season. FYI, the brown did match the Christmas fabric due to the brown in the ginger bread men. (I felt I needed to mention that since one does not typically think of brown as a Christmas color.) Because I consider myself a beginner sewer, I followed a pattern and the directions for a simple place mat provided by craftandfabricslinks.com . This site is a great place to find FREE patterns, sewing lessons, sewing project ideas, and links. Here is how my place mats turned out. The fabric was purchased at Joann Fabrics. I thought I would share this cute little pin cushion I made for my sister-in-law a while back. 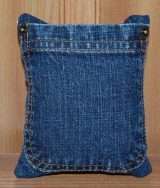 I simply cut out a piece of denim that included the pocket from an old skirt. 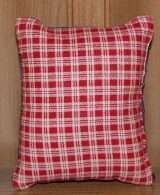 I then paired it with some red fabric that had some country style. I think it turned out nicely. The pocket can then be used to hold embroidery floss, needles, buttons, a thimble…the list goes on and on! A couple of summers ago, I wanted to pick up sewing. My goal was to purchase a book that would teach me some basic techniques through the creation of various items. I love handbags (what girl doesn’t), so I found a book that offered several different designs.The Sew Everything Workshop book is a must for anyone who loves to sew. It is especially useful for beginner sewers because the book actually offers patterns for the multitude of projects it teaches how to make. Projects include various clothing items, handbags, a doggy coat, a quilt, and a children’s stuffed elephant. I particularly love the “Tokyo Bag” offered in this book. Here are a few pictures of the ones I have made using various fabrics. Once you make this bag, it is a breeze to make. You can then alter your pattern to make a bigger bag.